Winter is a quiet season for birds in Alaska. Most migrate south to wintering areas in the Lower 48, Mexico, South America, and Polynesia. But, some species remain in Alaska through the winter. Even in the northernmost regions of Alaska, some ravens, snowy owls, and gyrfalcons remain, and offshore, murres and a few gulls linger near openings in the pack ice. Over 25 species endure the harsh winters of interior and western Alaska, and over 100 stay through the milder coastal winters of southcoastal and southeastern Alaska. Diverse in form, colors and habits, Alaska's winter birds fascinate observers. However, low numbers of birds, their secretive habits, and the short winter days make bird-watching difficult. Cold binoculars and frozen fingers don't help matters, either! Bird-feeding is a popular way of attracting some winter birds to areas where their beauty and activities can be enjoyed. This hobby is a rewarding way to learn more about birds and other wildlife. The success of a bird-feeding station is determined by the time it is operated, the types of food offered, and the placement of feeders. The following information is meant to help you operate a feeding station that will attract a variety of birds. More information on bird-feeding and on bird identification can be found at your local library or bookstore. Some birds will visit feeders year-round once they are familiar with the location of a dependable food supply. Birds are most easily attracted in winter, however, because natural food supplies are least abundant then. Feeders should be set up in late summer or early fall, then maintained through the winter and spring until natural food sources are again abundant. Once you begin feeding birds in the fall, you have make a commitment. A feeder often attracts more birds to an area than natural food sources can support. Thus, if you stop feeding them, the birds might not be able to find enough food to survive. So, if you plan a vacation, be sure to have someone restock you feeder regularly while you are gone. Species we should be careful NOT to attract include bears and moose. Those of us interested in wildlife can help avoid conflicts, which always end up with the moose or bears as the losers. To protect wildlife and keep problems from arising, either locate feeders out of reach of moose and bears, or put up feeders after bears are hibernating (Nov. 1) and take them down before bears begin to wake up in spring (mid-March). Don't feed birds in any way that will harm them. Keep feeders clean, and clean up the area on the ground around feeders that may attract other wildlife species to feeders. Most birds that can be attracted to feeders are insect or seed eaters. 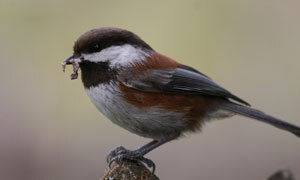 Insect-eating species, such as chickadees and woodpeckers, are attracted by animal fats or "suet." This can be obtained from the grocery store or trimmed from beef, pork, moose, caribou, or other wild meat. Fats that have a low water content are best in areas with severe cold, because they freeze at lower temperatures. Peanut butter, another fat, also attracts birds to feeders. Its sticky consistency occasionally causes problems for birds, so it should be mixed with melted animal fat and cornmeal or rolled oats. That expensive peanut butter will last longer if it is mixed with other ingredients, anyway. Seed-eating birds that can be attracted to feeders include pine siskins, sparrows, grosbeaks, redpolls, and crossbills. These species also eat suet, but seeds will attract them to your feeder. Unsalted sunflower seeds, thistle seeds, raw crushed peanuts, millet, scratch feed, various wild grains, and canary seeds are welcomed. Commercial wild bird seed mixes can be used, but they often contain filler seeds that are not eaten by many species. Often, you can mix your own "wild bird food" more economically. Seeds can be purchased from local feed, variety, and pet stores, or ordered from catalogs. When you first start your feeder, experiment with various seeds and find out which are preferred by the birds in your area. Fruit-eating birds, such as pine grosbeaks and Bohemian waxwings, are rarely attracted to feeders, but when snow covers most natural berries, wild cranberries, blueberries, or dogwood berries occasionally attract these colorful species to a feeder. Gray jays, Steller's jays, black-billed magpies and common ravens eat a wide variety of foods. Sliced apple halves and leftover table scraps may divert their attention from the suet long enough to give smaller birds a chance. Be careful not to give moldy food to birds, however, as it may cause illness or death. To prevent the spread of some avian diseases, food should not be spread on the ground, and feeders should be cleaned and disinfected regularly. Birds do not have teeth; instead, they grind food in their gizzards. Birds eat small pieces of sand and gravel, or "grit" to aid the grinding process. In winter, when the ground is covered by snow, suitable grit may be hard to find. You can supply grit to birds at the feeder in the form of crushed eggshells, coarse sand, or from boxes of grit that are sold at variety and pet stores. Water in a bird bath or other container often attracts birds in spring and summer, but the costs of maintaining open water through the winter are not justified. Birds survive on water derived from foods they eat and from eating snow. Seed-eating birds, like crossbills, are sometimes attracted by salt and other minerals that can be supplied by a salt block. If your yard has few trees and/or shrubs, birds will probably not be attracted to a feeder. Their need for shelter and protection from predators is often stronger than their attraction to an artificial food source. Also, because birds will not normally visit your yard in search of natural food if there are no trees or shrubs, they would be unlikely to detect food in your feeder. Don't despair, however! Start planning to landscape your yard for birds. Spruce and hemlock trees provide excellent cover; birch, willow, and alder provide natural seed sources, and some berry-producing plants attract birds that rarely come to feeders. A brush pile also can provide cover for some birds. For more information, read "Landscaping for Wildlife in Alaska." Different birds prefer different sorts of feeders and locations, so to get the most variety of birds, use two or more feeders. A suet feeder on a tree and a window- or tray-feeder for seeds is the simplest combination. The feeders shown below are just examples; use your imagination to design feeders that match the landscape and architecture of your home. When deciding where to place your feeders, remember that birds need protection from wind and predators, as well as perches to use while waiting to use the feeder. Thus, a feeder placed in the middle of an open yard may attract few birds. Try to put your feeders near shrubs and trees. However, thick vegetation around a feeder may provide ambush cover for cats. Keep free-roaming cats out of your yard, if possible. Put your feeders where they can be easily observed from a window to get the most enjoyment from them.